Handcrafted with solid walnut wood, McClure’s Walnut Veneto Conference Table feature a rich, dark coloration to add a sense of sophistication and character to your office space or conference room. 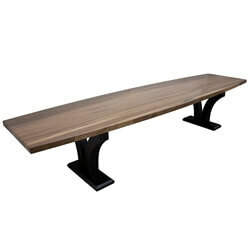 The table features intricately curved Veneto legs and a 2" thick continuous rail walnut butcher block top. McClure’s Walnut Veneto Conference Tables are made with beautiful hand-selected full-length rails to give a uniform color and appearance not found in blended grain furniture. These conference tables feature premium-grade, locally sourced Walnut to make the full-length rail table tops as beautiful and durable as possible.